Bring water to boil in large saucepan. Gradually stir in cornmeal; simmer on medium-low heat 15 to 20 min. or until thickened, stirring constantly. Remove from heat. Stir in cheese and pepper. Pour into parchment-lined 13x9-inch dish. Cool completely. Refrigerate 1 hour or until firm. Heat barbecue to medium heat. Heat oil in large skillet on medium-high heat. Add mushrooms; cook 3 to 5 min. or until softened and golden brown, stirring frequently and adding thyme and garlic to the skillet for the last minute. Stir in pasta sauce and milk; simmer on medium-low heat 3 to 5 min. or until heated through, stirring frequently. Stir in parsley. Remove from heat. 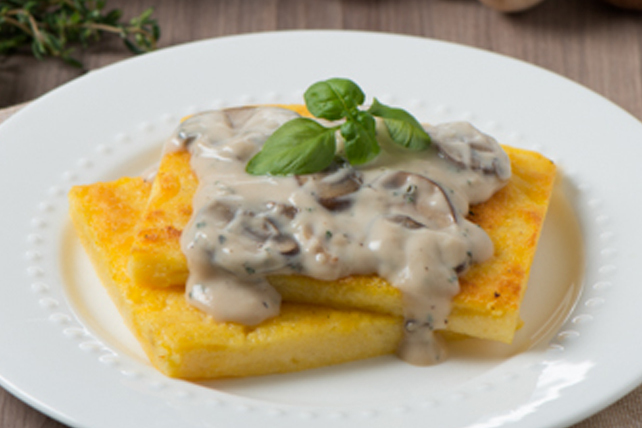 Cut polenta into 12 rectangles. Grill 3 min. on each side or until heated through and grill marked on both sides. Serve topped with the pasta sauce mixture. Garnish with fresh parsley, thyme or basil sprigs before serving. Prepare using Classico Alfredo di Roma Alfredo Pasta Sauce.